The world’s longest train tunnel has opened in the Alps in Switzerland after 17 years of work. It will accommodate both commercial and passenger trains, shaving up to 45 minutes off trips between Zurich and Lugano. 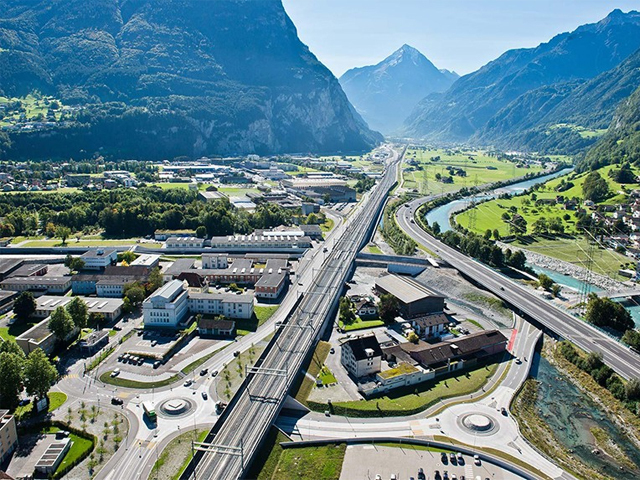 A tunnel through the Alps in Switzerland that has taken 17 years to build officially opens today. 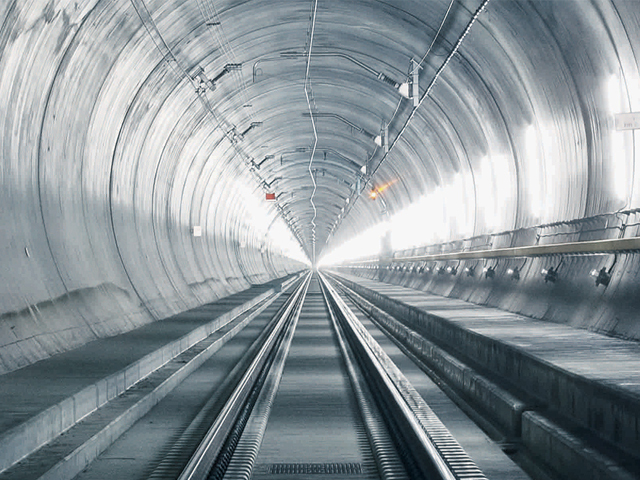 The Gotthard Base Tunnel stretches for 57 km, making it the longest rail tunnel in the world. In addition, at 2300m below the surface of the mountain in places, it is also the world's deepest rail tunnel. 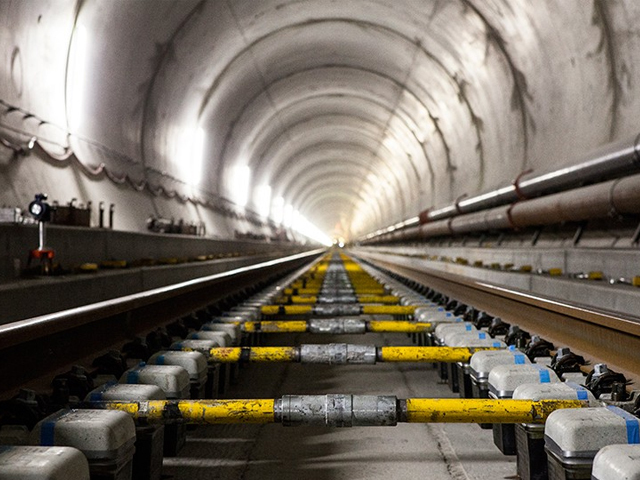 London's Crossrail is regarded as the largest construction project in Europe, but includes only 42 km of new tunnels. The Gotthard Base Tunnel is also just over 3km longer than the Seikan Tunnel in Japan and just under 7km longer than the Channel Tunnel between the UK and France, both of which provide rail passage. It is the ninth longest tunnel of any type in use in the world. Taking into account the two main tubes that comprise the Gotthard Base Tunnel and its various shafts, cross passages and access tunnels, it actually has 152 km of tunnels in total. It is also said to have virtually no gradients. The initial idea for the tunnel was conceived 68 years ago, but the plans were redrawn on a number of occasions. Once construction finally commenced, there were 2,400 workers on site at peak times. There were a wide variety of different rock types through which it was necessary to bore, including granite and sedimentary rock. Around 80 percent of the work was carried out by tunnel boring machines, with the final 20 percent undertaken using blast methods. In total, 28.2 million tonnes of material was excavated. When work began on laying the slab track, the task took 125 workers working three shifts around the clock over three years to complete. The process used 131,000 cu m of concrete, 290 km of track and 380,000 sleepers. The tunnel connects Erstfeld with Bodio and will see 325 trains per day run through it, of which 260 will be 160-km/h freight trains and 65 will be 200-km/h passenger trains. 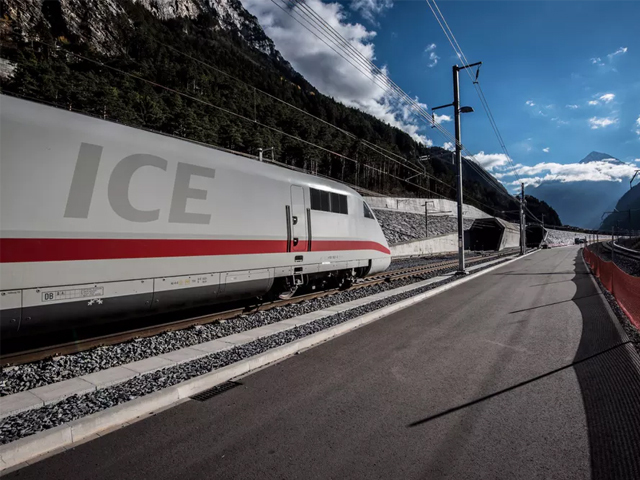 The speed of those passenger trains is expected to rise over time to a potential 250 km/h and the journey-time between Zurich and Lugano, which are north and south of Erstfeld and Bodio respectively, is expected to be cut by around 45 minutes. 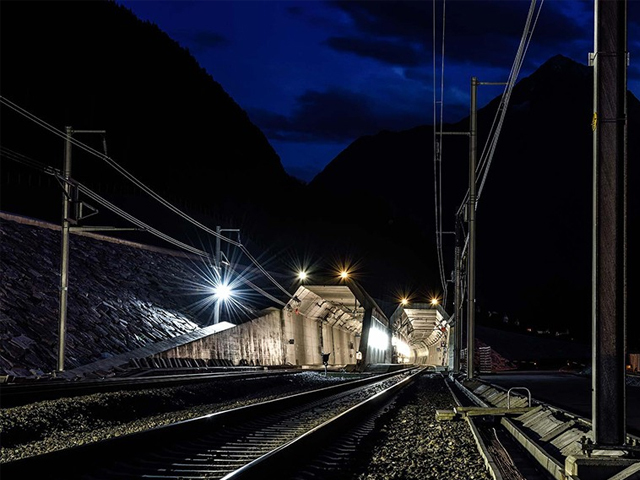 Commercial services for the Gotthard Base Tunnel are scheduled to begin in December 2016.